The long-awaited report amounts to a rebuke of educational technology, a business whose growth has been spurred by schools desperate for ways to meet the testing mandates of President Bush's No Child Left Behind law. At first, because right or wrong, OLPC XO's will not be in USA schools and this report was associated with the controversial NCLB emphasis on testing, I didn't think it was applicable to the OLPC debate. "We are concerned that the technology that we have today isn't being utilized as effectively as it can be to raise student achievement," said Katherine McLane, spokeswoman for the Department of Education. County Superintendent John E. Deasy said the programs aren't magic bullets. "No technology adds value by itself," he said. "Just employing software is not likely to lift test scores for students." Ephraim said she blamed the school system, because teachers were not prepared or properly trained to use the technology. Elliot Soloway, professor of educational technology at the University of Michigan, said that teachers need to be better trained and that administrators need to wait more than one year to see results. What might these quotes say to you? To me they echo the conclusion of the Wall Street Journal, Education Week, and again the Washington Post, that for any technology implementation, and especially when attempting to increase educational outcomes using technology, extensive teacher training must be an integral part of the process. Training not only on how to use the educational software, but also how to seamlessly integrate it into an educational curriculum, a focus on education, not laptops. It's not by training teachers. It's not about building schools. With all due respect [to HP's e-inclusion efforts], it's not about curriculum or content. It's about leveraging the children themselves. And now we have a serious disconnect. A major educational software study questions technologies in education, those involved imply that teacher training is the key to technology incorporation, and yet OLPC dismisses that very idea. Negroponte is relying on "magic", his OLPC implementation miracle, for educational success. Your conclusion that this study, "questions technologies in education" is not correct. This is simply about test scores. The apologists for this study are just shifting blame and justifying their purchases. These systems are typically sold as being "teacher-proof" so that even teachers who aren't well-trained can use them. Districts spend millions of dollars on them, so they must be right and teachers must be wrong or they wasted their money. Guess what, they wasted their money. It's these software packages that claim to teach standardized test content that are the problem, not the teachers who are required to plop their kids down in front of them for hours at a time. The OLPC has never claimed that it will increase test scores, much to their credit. So I just don't see a "major disconnect." I couldn't agree more with your post's quote of: "C’mon people, let’s speak the truth and make meaningful distinctions between educational software that pretends to replace teachers and technology that gives students agency and supports a learning community." Unfortunately, the OLPC leadership routinely discounts the need for teachers at all. Negroponte gives the impression that countries just need give the children the laptop and they will "learn learning" - no teachers needed. Educational software replacing teachers with no pretension. I understand Negroponte's reluctance to hand over the laptop implementation to teachers. Technology integration in the US has stalled for 30 years because we continue to teach teachers about technology and then hope it trickles down to the classroom. In most cases, it doesn't. If he expects a "miracle" from the kids, it's because there has been no "miracle" from teachers. 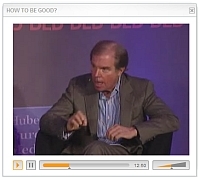 The organization I work with (Generation YES http://www.genyes.com ) has a similar philosophy to Negroponte - directly traceable back to Papert. We work with schools to establish student technology mentors for teachers. We don't, however, bypass teachers, but rely on one at each site who agrees to be the coordinator for the students. All in all, I'd bet on the kids. I too am willing to bet on the kids, and your program sounds like it does, in concert with adults. But when the teachers are told they are not needed, that working with them is a waste, and the new tool replaces them, the technology become a target for abuse, ridicule, and sabotage. The whole idea of change becomes directly threatening to the status quo of those in power and then all bets are off. wayan: "The whole idea of change becomes directly threatening to the status quo of those in power and then all bets are off." I agree with you on this. And the educational ministry in developing countries invariably has major political power. If the teachers tell the higher-ups that they are threatened by olpc, then the project is liable to be simply ended, no matter how much good it is doing. Has Negroponte or anyone else in the olpc project thought about how to avoid this problem? For what I've read, there's little actual discussion about the teacher's role in implementing the XO in the Latin American countries that have considered using it, I guess due to a combination of a)the issue being still a matter of high politics, not of educational public policy, and b)concern about what the teacher's unions will say. I do believe that if you go with "kicking legs" into denying any role for teachers, as Negroponte usually does, you'll get one hell of a fight and a complete political failure, at least in Latin America. There is no way to avoid politics no matter what approach you take. So you might as well get as close as possible to your intended model rather than trying to create a complicated indirect conduit through teachers. Some teachers will never cooperate no matter how easy you try to make it. We've been trying to beg and cajole US teachers to use technology for decades and it hasn't worked. Why recreate that model? Because while the teachers' unions are famously resistant to change in the USA, they are but peons compared with the power of the South American Ministry's of Education. There, the Ministry of Education is usually one of the county's largest employer, and no one - not the teachers, their bosses, their families, or the society itself will stand for a reduction in involvement or statue of teachers in education. "if you speak to my colleagues in industry, whether it is Cisco or Intel or something like that they will talk to you about teacher training and so on and I say well, training is for dogs. We train dogs, we don’t train children, ok."
Following Wayan's lead, let me add that teacher's unions tend to be some of the most radical, left-leaning unions possible. They thrive on conflict, and as soon as they get hold of the kind of pronouncement like the one Wayan quoted, they'll start shouting brimstone and fire. It's not a matter of some teachers not cooperating; it's a matter of a very significant group of highly organized individuals feeling that they are going to be not just excluded, but put on the road to extinction. Also, what's the intended model? I haven't yet to find one clear statement of any politician fully supporting Papert's approach. The XO is being seen as just another computer, to be used exactly like all previous computers have been used, only significantly less expensive and available to all, or at least to many. So the real questions are going to be put on the table later, and the arguments about exactly what is going to be achieved through this particular project is yet to be defined. Without explicit, clear goals, this project is going to be defined by all the way they like, and that's the reason why so many still believe that the XO comes with its own educational model and some many that think that the model (no matter how bad) will still be there no matter how many computers you put in kids' hands. Eduardo: "Following Wayan's lead, let me add that teacher's unions tend to be some of the most radical, left-leaning unions possible. They thrive on conflict..."
It's probably best to leave out this type of description. It confuses me that Negroponte's statement would be taken as anything else but respect for teachers and children. "...they will talk to you about teacher training and so on and I say well, training is for dogs." I agree, to talk about teacher "training" is to deprive them of their stature and professionalism. You train people to follow orders and do things on command. You teach people to think for themselves. Why would saying that "training" is undesirable anger anyone? "Now when you go to these rural schools, the teacher can be very well meaning, but the teacher might only have a sixth grade education. In some countries, which I'll leave unnamed, as many of as one-third of the teachers never show up at school. And some percent show up drunk. " You quote Negroponte a couple of times in a negative sense, once in your orginal article and once in a comment. In the first quote he is talking about the importance of "leveraging children". In the second quote he objects to the term "training" and says that training is for dogs, not for children. You point out that such talk will meet resistance from proud teachers and education departments. And that for technology to be successful requires more teacher training. Negroponte is not relying on "magic" as you suggest. Kid power is not magic. It's real. The other issues being discussed about by-passing teachers and the best way to inservice teachers in technology use I think are important (and require a lot of discussion) but the key issue here IMO is the context described by Negroponte where kid power, linked to the OLPC, is clearly the best way forward at this point of time. What else do your suggest for that context? OK, that's fairly outrageous - but consider this argument. You are saying (and I'm sorry if I'm conflating different people's arguments here) that teachers (or their representatives) will oppose this because they weren't included or feel threatened. If that's true, and acknowledging that the OLPC project does not hide the goal to leapfrog the current status quo, it would seem that the keepers of the current systems would oppose it on the face of it. So negotiating some compromise is at best a waste of time and at worst, potentially damaging. You seem to be saying that he shouldn't say things to make certain groups angry who aren't going to help anyway. To me, his tactics are not a big risk on his part, especially if what he says is true. I highly doubt that these issues would be solved if Nicholas were nicer. "Eduardo: "Following Wayan's lead, let me add that teacher's unions tend to be some of the most radical, left-leaning unions possible. They thrive on conflict..."
It's probably best to leave out this type of description." Patrick, the reason it should be left in and discussed is it is true. "If that's true, and acknowledging that the OLPC project does not hide the goal to leapfrog the current status quo, it would seem that the keepers of the current systems would oppose it on the face of it. So negotiating some compromise is at best a waste of time and at worst, potentially damaging. I highly doubt that these issues would be solved if Nicholas were nicer." Sylvia, what we are saying is that this is a huge problem and is likely to sink the whole project. If Negroponte and the rest of the oplc crew were to try to figure out some way of dealing with it, instead of just pretending they are going to be able to roll over the teachers and the Ministry's of Education, then maybe they could come up with a creative response that would get the teachers and M of E on board. Along these lines, what does constructivism say about dealing with interpersonal conflicts? Surely not that you should pretend you can just force your way on the other party, or somehow sneak what you want past them. "Sylvia, what we are saying is that this is a huge problem and is likely to sink the whole project. If Negroponte and the rest of the oplc crew were to try to figure out some way of dealing with it, instead of just pretending they are going to be able to roll over the teachers and the Ministry's of Education, then maybe they could come up with a creative response that would get the teachers and M of E on board." Negroponte is promoting those core principles. It amounts to kid power and the expectation that teachers are capable of adapting to that. What's the problem here, shouldn't teachers be empowering their students? Really, Wayan, Eduardo, Eduardo, why do you guys want to compromise the vision, to water it down to common and mediocre practice in developed countries when we know in our hearts and minds that we could be doing much, much better in the developed countries. I say that Negroponte ought to be commended to not caving in to this sort of pressure. I commend Negroponte for dreaming and inspiring us with that dream. But we live in reality, and the OLPC will be deployed in reality. A reality that is way larger than a handful of computer kiosks in India and more complicated that just promoting kid power. That's a great link. Your paper helped me understand Papert much better. But how will these teachers get trained in developing world countries? Another great link, but nothing about training the teachers. In your paper you explain at length that there is great resistance in public education systems to the constructivist educational philosophy, and it can be overcome only through sustained social and political struggle. The problem is that oplc seems to be trying to get going in developing countries without any plan for overcoming such philosophical resistance. Patrick, I did not qualify my statements with "Latin America", the only region I feel comfortable discussing. And in this region, this observation is true and to ignore that reality would be a complete mistake. I come from a very radical background but I've changed: union's bureaucracies haven't. And Bill, I don't want to compromise the vision. I simply do not believe it works, as I've stated before. And by vision, I don't question the educational assumptions themselves, but the clear intent of steamrolling governments into spending almost of the money available for education, and then so, into one particular project that at best, is based on too few and too little experience in the real world, in the scale we're talking about. "As with any technology, there are opportunities for abuse; undoubtedly, some of the laptops will be stolen; some will never reach the children; some will be used for rote instruction; some won't be used at all. However, our experiences in virtually every pilot we have either studied or run over the past 40 years suggests that the impact of empowering children, their teachers, families, and communities with computation and communication has a net positive impact on learning, social cohesion, local economies, etc." 3) is less relevant in some of the environments where the OLPC is going simply because of limited educational opportunities - see extract from Negroponte talk posted earlier - in these environments the OLPC is ideal because it's mobile, take home, mesh network for after hours communication etc. I think you guys are insisting that the scheme be perfect before anyone does anything. If Negroponte thought like that he would just be a wealthy ex MIT professor. He's not that, he's giving the whole thing his best shot, trying to help the poor. It sounds to me like you want a worked out blueprint about how to train all teachers in constructionism, else ditch the whole thing. Bill Kerr cites the Hole-In-The-Wall experiment in India as proof that "...poor youth can learn quite a lot about computers without any adult help at all". Many others have made similar statements, but it does not follow that proficiency in using computers is equivalent to a primary education. Most of the people reading this site learned computer usage informally, through peer networking, as did I. This is typical of new technologies. But primary education deals with a lot more than mere technical proficiency, as Eduardo Villanueva has pointed out in his posting on this site: "...things like social cohesion, a common historical frame of reference for all, development of local knowledge, promotion of aboriginal languages, and a really long list..."
Primary education has to work for every child - not just a percentile who will go on to become "tech-savvy". While I quite agree that kids will "learn learning" given a powerful information tool like the laptop, the whole problem is what they will learn and how it will allow them to fit in to their society (yes, and change it as well). A project that puts laptops into kids' hands and then walks away leaving the kids themselves to decide what to learn is committing a disservice both to the kids and to their society. And if they make the sale, as OLPC attempts to do, based on the idea that exposure to the technological tool will bypass the need for teachers, schools and education, then they are committing a disservice to all of us who want to create, disseminate and use tools that work within their local contexts and gain buy-in from all segments of the society. It is a disservice because we will be lumped together with OLPC and its supporters in the aftermath. + Learning to use a computer is not the same as gaining a primary education. + Cutting adults out of the kids' learning process will not benefit their societies. + Claiming that since Papert and Kay have done the thinking there is no need even to summarize the conclusions upon which OLPC is acting is a form of intellectual fraud. Aside from the arguments about Papert's influence on this project, I'm worried because of Negroponte's past involvement with projects outside the U.S.: the media lab in India, and Digital Nations which was aimed at getting countries to sign up to support the lab in the same way that we did at Apple (or their other corp. sponsors.) Those intl. efforts did not work well. The other precedent for not involving teachers was over ten years ago: Net Day which started here in Silicon Valley where it was assumed that teachers were part of the problem, and so was the administration that was keeping kids from having access to the wonderful Internet. It was based on a gung-ho volunteerism with a lot of participation by well-meaning techies and there were photo ops for then Pres. Clinton and V.P Gore who pulled red-white-blue cat5 cable through the high school where my ex-wife went to school. what happened later is that professionals had to come in to many school to fix the network problems left by the volunteers. It was a very mixed blessing. As for the XO rollouts I hope that foundations and researchers are planning studies of these from the start and not wait for a year or more. I bet the proponents and critics will find elements to support their views, and I hope to modify other opinions. My viewpoint has been changed over the years after I funded grants where I did not think enough about the support needed or the barriers encountered by the people trying to implement ICT projects. In addition, my wife is an elementary school principal here in Silicon Valley, and there is way more kids need to learn that will not be found in front in any screen, no matter how cool it may be. Nevertheless, if OLPC is used in Instructionist ways, as will happen in lots of places, it will still do more good than harm IMO"
I was not saying that oplc would do harm. Rather I am saying that if, as you yourself say, constructivism cannot be introduced into a conventional educational system without a sustained political and social struggle, and if, as you seem to indicate, oplc is not doing this, then oplc will simply be kicked out once the teachers and the educational hierarchy realize what a threat it is to their philosophy and ways of doing things. This conclusion makes me unhappy, but it seems to be true. "I was not saying that oplc would do harm. Rather I am saying that if, as you yourself say, constructivism cannot be introduced into a conventional educational system without a sustained political and social struggle, and if, as you seem to indicate, oplc is not doing this, then oplc will simply be kicked out once the teachers and the educational hierarchy realize what a threat it is to their philosophy and ways of doing things. This conclusion makes me unhappy, but it seems to be true"
Constructivism is largely about creating the right educational environment for learning - an environment that enhances opportunities for meaningful making and communication. By its designed intent (hardware, software, sugar UI)and as also strongly reflected in the core principles http://wiki.laptop.org/go/Core_principles of child ownership, low ages, saturation, connection, free and open source the OLPC goes quite a long way in transforming the educational environment. The very existence of OLPC in these communities already transforms the environment into something very different from conventional computer use in developed countries, where computers are chained up in labs with limited access. The model of education we have in developed countries is not static, nor is it some form of "best practice". some of the comments on this thread are implying that it is set in concrete and can never change. Happily the world is changing and OLPC is pushing along that change. "The very existence of OLPC in these communities already transforms the environment into something very different from conventional computer use in developed countries, where computers are chained up in labs with limited access." "Governments, education departments, teachers in countries that buy the laptop can either go with the designed intent or not understand it or actively reject it. What I would hope is that in the new learning environments created by the OLPC that many teachers would rethink their traditional roles." "It is just wrong to say that people like Seymour Papert and Alan Kay are condemning teachers out of hand." But we keep pointing to what **Negroponte** who is head of the project has expressed himself quite negatively about teachers, which implies oplc is not reaching out to them. So let me ask you, what is oplc's specific method for dealing with teachers, and do you think their approach is correct or not? "But we keep pointing to what **Negroponte** who is head of the project has expressed himself quite negatively about teachers, which implies oplc is not reaching out to them. So let me ask you, what is oplc's specific method for dealing with teachers, and do you think their approach is correct or not?" On April 7 in this thread I responded to Wayan and said he was taking some things Negroponte had said without providing the full context and I quoted an extract from Negroponte to illustrate that point. No one here has really responded to that point, that Wayan has misrepresented Negroponte by taking some things Negroponte said and quoted them in isolation out of the full context. "That's why I wrote the post. Negroponte's comments were shocking, both to me and the assembled Ministers. But his comments are not new. If you listen to the Forrester presentation, he seems to discount the need for teachers in general. That children only need to learn learning to be successful participants in society. "Now, some people will tell you that the thing to do is to train teachers, to build schools, to make curriculum better, to make sort of the current education system better and in no way for those of you who are blogging at the moment please underline this, in no way are we saying don't do that, stop doing that, teacher is not important, schools aren't good. What we are saying is that that method like building roads and pouring concrete and doing all of those things is going to take a very long time, it's going to take years and years. So, is there something we can do in the meantime? Something to in fact leverage the children themselves." Bill, your comment partially reinforces what I am saying. "In the environments that Negroponte is describing the OLPC will do a lot of good irrespective of the training of the teachers." What we are saying is that if you don't get the teachers and the rest of the education ministry hierarchy on board from the begining, then they are liable to feel threatened, and as a consequence they will simply **halt** the oplc project in their country, including taking back all the laptops from the children. And then it is all over. Would you agree this is a possiblity? And that for ths reason it would be a good idea to try to get the teachers and higher ups on board from the beginning? Now as you have pointed out there is another possiblity. That is that the educational establishment will feel threatened by the constructivist approach, and will decide to convert oplc to a teacher-centered approach. But in that case wouldn't they convert over to the Intel Classmate laptops, since, unlike oplc, they already include an entire teacher-centered system, and so they wouldn't have to go to the great trouble of building one from scratch? Well, maybe they would adopt Classmate for where there is adequate electricity, and keep oplc for where there isn't. So oplc would still be doing some good, though not nearly as much as you, as a constructionist, would like to see. Or maybe they would decide it is too much of a hassle to support two laptops, and just stick with Intel. Those are the multiple scenarios I think are possible. Do you have a list of possible scenarios?